Here we go. 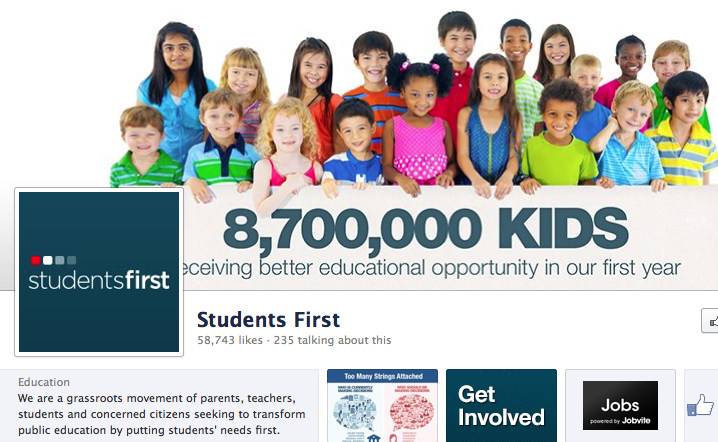 Michelle Rhee and her ironically named “Students First” organization will soon announce their first big political move in California. Will it be about students, and putting their needs first? Well, heads up, Los Angeles! They’re coming your way, and your students sure could use some help from this influential and well-funded crowd. I know your students are dealing with shorter school years, class sizes over thirty, over forty in some cases, closed libraries, and a serious lack of all sorts of in-school supports that help children. I know these supports are so desparately needed when we have record numbers of homeless students and students living in poverty, when obesity, diabetes, and asthma are on the rise. Students first! That sounds great! Sorry to get your hopes up, however. Their first big move in California will be to support a piece of legislation that will eliminate “last-in-first-out” (LIFO) policies applying to teacher layoffs. Yes, that’s their big agenda for helping children. No resources. No new hires. No support. Just the option to have different layoffs. I do understand their argument. They will say that “quality-blind” layoffs prevent schools from building the strongest possible staff. They will trot out their recent survey showing 75% of Californians agree that we should end LIFO. If I thought 75% of Californians knew why LIFO exists and what the consequences would be if it’s eliminated, then I might be more impressed. Of course we all want the best possible teachers in classrooms. This bill won’t help make that happen, especially not in current working conditions in most public schools, and in the current economic climate. “Students First” and their allies are holding an event in Los Angeles, a city with massive overcrowding in classrooms, hundreds of schools without libraries, furlough days, and they are throwing their weight and their millions of dollars behind an idea that will not directly help one single student, will not provide any resources to any teachers, will not open one library. “Students First” and allies are talking about how to better handle layoffs at a time when we should be stopping the flood of layoffs. Our need for teachers is growing and we’re arguing about the best way to let teachers go. With their influential and incredibly wealthy allies, they are throwing their energy into the politics of division, again, not helping one student or teacher. Does LIFO need fixing? I would agree that it does, when implemented as it is currently, especially in large districts. I do not like to see some schools take the full brunt of layoffs because they have a younger staff. I do not like to see teachers assigned to subjects or grade levels they are ill-suited to teach just because their seniority allows them to stay and bump out someone who is qualified to meet the needs of a given classroom. I think prior lawsuits and settlements, and actions by LAUSD and SFUSD have attempted to deal with that issue, with minimal success. We have members of Accomplished California Teachers who have been taking the anti-LIFO position in this regard, and arguing against the position of CTA. I would suggest that a modified form of LIFO might apply seniority guidelines at the school level, and with more care not to bump teachers into classes they’re not qualified to teach. 1. We’re putting the cart before the horse. If everyone is in agreement that teacher evaluation needs reform, why are we talking about putting evaluations to new, even higher-stakes uses before we fix evaluation? Ending LIFO will actually impede any useful reforms in evaluation because it will undermine the idea that evaluation should focus on growth and improvement. This will remove any incentive to be honest and forthcoming about areas of growth and improvement. 2. Ending LIFO will undermine collaboration in schools. Despite its faults, seniority ensures order and teamwork in schools because your colleagues are not your competitors. You know that whether you stay or go will not be determined by some sort of order that is formed subjectively. If layoffs are looming, what is the incentive to help other people learn to do your job? Schools are unstable and demoralized enough. This will make it worse. 3. This reform would make veteran teachers more vulnerable because they earn more. If you’re an administrator facing any tough decisions about which teacher to let go and there’s tens of thousands of dollars of extra pay involved, it’s easy to see that the more expensive teacher is going to have a harder time being evaluated strictly on merit. Now, in the title of this blog post, I used some inflammatory language. I intend to back it up. “8.7 MILLION KIDS receiving better educational opportunity in our first year” is a bold claim – and one they don’t back up or explain on that page. I couldn’t find any reference to that number on their website. I posed the question to them via Twitter, but maybe they thought I was kidding when I wondered how they come up with that number. My guess is that they’ve added up the number of students in states that have passed bills they support. If I’m right, I guess they’re not waiting for any actual results. Rhee is not so data-driven after all, it seems. Of course, if the data are test scores, you might get involved with talking pineapples or clever erasers, so maybe it’s best just to leave such sticky matters aside. Note that they also claim to be a “grassroots” organization. Is that what you call it when the favorite star of national education “reform” takes huge amounts of money from private donors, opens offices all over the country, and launches a political action committee? Grassroots? Or when she flies into Florida to support a “parent empowerment” bill and several actual grassroots parent organizations in this “reform” friendly state line up against you and bring the bill down? Is that grassroots? But what about their millions of members? They make you a member if you clicked to sign a petition to pay teachers more. Grassroots organizing at its finest – counting people as “members” without asking, (though “members” can opt out later). The online rhetoric and the patently manipulative organizational name will only take them so far, though. From where I sit, I mainly see Michelle Rhee lobbying for bills that undermine teacher unions and weaken our profession. As Matt Miller recently realized, the states and nations with the top education performance are mostly those with strong teachers unions, which defeats the logic of attacking unions and saying it’s for the kids. Especially here in California, where the California Teachers Association has something absolutely essential that “Students First” lacks – an actual track record of making a positive difference in actual schools with actual children. Most recently through the Quality Education Investment Act and through some innovative programs funded by CTA’s Institute For Teaching, we can see clear examples of the union playing a leadership role in making sure that students’ educational needs are being met in direct and concrete ways. A recent study put out by SRI International praised the quality of labor-management relations in two districts they studied, where unions are at the fore in conducting better evaluations that hold teachers to higher performance standards. At this point, you probably won’t see Davis Guggenheim show up to document (or stage) scenes of great union teachers doing great work for students as part of their average, ordinary day, but if California students are looking for superheroes, they’re much more likely to find them in schools already. Don’t look for heroes among the politicians in Los Angeles tomorrow, standing in front of microphones and cameras waiting for their close-up, fighting the wrong fight and ignoring the kind of help that should really go to students first. David, great post. I’m not a fan of LIFO, but I can see your points here, and it’s enough to make a California teacher nervous. I wonder if there is a way to combine seniority with a whole series of evaluative tools. I think those of us who are frustrated with the educational system as it exists (and this includes the seniority list and all it entails) are frustrated with the concrete all or nothing, inflexibility of the process. I agree that so many of those making decisions for Ed who don’t work in Ed cannot see the complexities of the issue and are willing to disseminate the system without alternatives in place. Multiple measures in the form of formal observations, colleague surveys, student surveys (over a period of time), test scores, and yes, seniority should all figure into the privilege to be a teacher. For it is a privilege. So it’s up to teachers and others in Ed to ensure we are a willing voice in the reform. Nevertheless, the inability to retain great teachers IS about students. Is it the only issue? Of course not. Is it the issue that will make or break student achievement in this country? Probably not. But if it’s where these extremists want to start, we can’t fight the need to reform enough so that we aren’t a voice at the table. Thanks for your input, Heather. You are one of many teachers who have pushed my thinking on this matter by sharing your stories and perspectives over the years. And look – here we are, teachers identifying the needs and seeking balanced solutions. Wouldn’t it be nice if Students First and like-minded groups would try working with us instead of going straight to legislation and litigation. Wouldn’t it be more “students first” to engage with the people who take care of students and teach them? That said, we need to do our part and speak to our unions (and write) about our desire to revisit the issue, look at compromises and improvements. 3) Two days before the start of the 2011 – 2012 school year, The State Board of Education mandates that the Miami School Board enact involuntary transfers such that every teacher in the low performing school be transferred out and replaced by a teacher from this high performing pool. None of the teachers affected will be notified prior to the transfer.